Greetings from the Association of the United States Army (AUSA), our Army’s and our soldier’s professional organization. The feedback from all the noncommissioned officers and soldiers who attended this year’s Association of the United States Army Annual Meeting and Exposition was overwhelmingly positive and enthusiastic. This feedback covered the full spectrum of events from the Army Ten-Miler, to participating in the Warrior Challenge with Sgt. Maj. of the Army Daniel Dailey, to the professional development forums and recognition events centered on noncommissioned officers and soldiers, and to the amazing displays throughout the five exhibit halls. The attendance at the meeting topped 31,000 and our soldiers, the Department of Defense and Department of the Army civilians, family members and many friends of the Army were present and participated in an action-packed, three-day event. The planning for next year’s AUSA Annual Meeting has already begun and is scheduled for Oct. 14-16. While the 2018 Army’s Best Warrior Competition awards came to a close at the Annual Meeting, the best sniper teams from around the world were converging on Fort Benning, Ga., for the 2018 United States Army International Sniper Competition. A total of 30 sniper teams representing the Army, Army National Guard, Army Reserve, United States Marine Corps, Navy, Coast Guard, Federal Bureau of Investigation (FBI), Sweden, Canada, Denmark, Ireland, Australia, United Kingdom, Germany, Israel, New Zealand, and the Netherlands completed the 18th annual event. 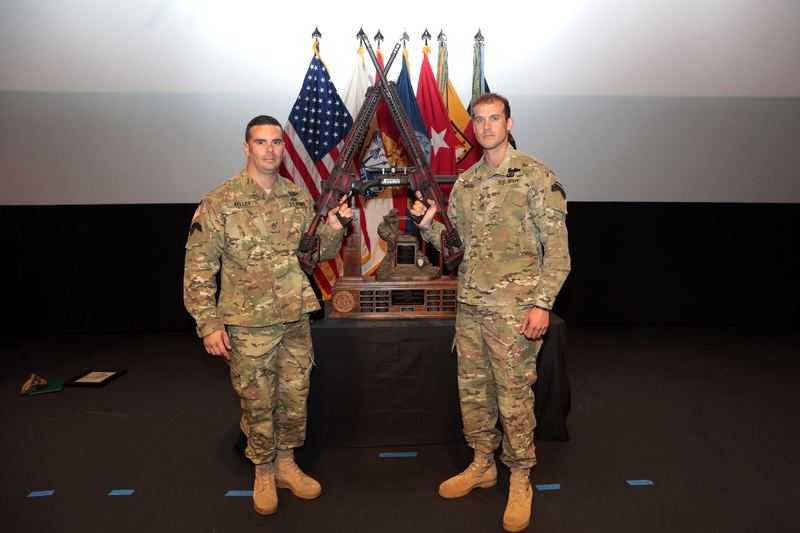 This year’s top sniper team for the second consecutive year was the team from the 75th Ranger Regiment, Fort Benning. Ga., that performed consistently throughout the competition in all the physically and mentally challenging events executed during the three days. Staff Sgt. Jonathan Roque and Staff Sgt. Brandon Kelley demonstrated for the second year in a row that they are the best two-person sniper team in the world. “Our training philosophy, our competing philosophy has always been the same. It’s expectation management when you go into it and try to get some points on the board, and be consistent, consistent, consistent. It always translates to cumulatively a good score,” said Kelly. Roque and Kelley scored the most points in the multi-day competition that involved two-person teams from across the Army, from other services in the Department of Defense, from the FBI and from 10 international countries. All the teams were tested in long-range marksmanship, observation, target detection, stalking, reconnaissance and reporting, and the ability to move with stealth while concealed. In second place was the team from the Colorado Army National Guard – Staff Sgt. Michael E. Fulmer and Spc. Tristan Ivkov. In third place were the airmen from the Swedish 17th Wing, Air Force Rangers – Lance Cpl. Erik Azcarate and Lance Cpl. David Jacobsson. In addition to the top three finishers receiving recognition at the closing ceremony, awards for Top Stock, Top Spotter, Top International Team and the Iron Man Team also received recognition. The Top Stock award was Team 17, 75th Ranger Regiment with Staff Sgt. Roque and Staff Sgt. Kelley. The Top Spotter award went to Staff Sgt. Michael E. Fulmer, Team 9, Colorado National Guard. The Top International Team award winner was Team 30, Swedish 17th Wing, Air Force Rangers with Lance Cpl. Azcarate and Lance Cpl. Jacobsson. Iron Man Team was awarded to Team 30, Swedish 17th Wing, Air Force Rangers with Lance Cpl. Azcarate and Lance Cpl. Jacobsson. Like the Best Warrior Competition, the Best Sniper Competition represents the ultimate competitive event where each competitor was able to demonstrate both their physical and mental competencies. The airmen from the Swedish 17th Wing Air Force Rangers won first place in the European Best Sniper Competition last month, which was held at Grafenwoehr Training Area, Germany. This team had only been together for three months since graduating their sniper training. Additionally, the Swedish team did not bring their issued rifle or scope they used in the European competition. “It proves our education is good back home in Sweden,” said Jacobsson. Many of the team members talked about the camaraderie and competitiveness of the competition, but they also spoke highly about the best practices they learned from each other. Staff Sgt. Daniel Grogan and Sgt. Charles Gifford from the 1st Battalion, 23rd Infantry Regiment, 1-2 Stryker Brigade Combat Team, 7th Infantry Division, Joint Base Lewis-McChord, placed second among the U.S. Army division teams and 13th overall in the competition. “One of the best parts of being a sniper is teaching other soldiers the basics, everything from aiming techniques to firing positions,” said Gifford. “All these competitions are fantastic because they bring together the best across the world in a specific area and whenever we have the best together everybody’s going to learn something, everybody’s going to leave better than they were,” said Capt. Gregory Elgort with the U.S. Army Sniper Course. “And everybody is going to take away a new tactic, a new technique that they didn’t know from somebody else,” Elgort added. Keep America’s Army Strong! Take a Stand!